CHARLOTTETOWN–Animal Justice Canada Legislative Fund (“Animal Justice”) is calling for amendments to a government animal protection bill. If enacted, Bill 2, the Animal Welfare Act, would replace the existing Companion Animal Protection Act and introduce sweeping exemptions for animal-use industries, rolling back the protection of animals in PEI. “Further, it does little to address the conditions that allow puppy mills to flourish. It also fails to address many cruel practices already being banned in other provinces, such as tethering, hoarding, and abandonment. Amending the definition of distress to remove the vague and undefined requirement that an animal experience “extreme” pain or suffering before legal action may be taken. 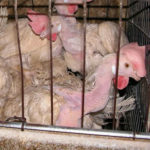 Removing exemptions for cruel and unnecessary industrial agriculture practices such as intensive confinement and crowding, mutilations without painkillers, genetically manipulated rapid growth, a lack of access to the outdoors or clean air, gassing fur-bearing animals, and generally preventing farmed animals from doing anything that is natural or enjoyable for their entire lives. Creating standards of care applicable to different classes of animals to provide clear direction on how animals must be treated. Requiring regular, unannounced inspections of animal facilities so that investigators can be proactive in monitoring animal welfare. Prohibiting the possession of exotic animals as pets and in circuses and zoos. The proposed statute has been five years in the making. It is the result of the Department of Agriculture and Forestry’s (now Agriculture and Fisheries) commitment to improve its internal procedures and overhaul animal welfare legislation following the conviction of Bud Wheatley in 2010 in relation to the operation of a well known puppy mill in PEI. During sentencing, Judge Nancy Orr described the situation as incredible, and expressed her concern that inspectors had allowed animals to live in such appalling conditions for so long.